I can't say that I am too familiar with Sparklehorse, the band that's in the news today because its lead singer, Mark Linkous, apparently committed suicide yesterday. (See here for the coverage at Rolling Stone.). Linkous started out as a guitar tech and roadie for the band Cracker before beginning his own musical project in the mid-1990s. 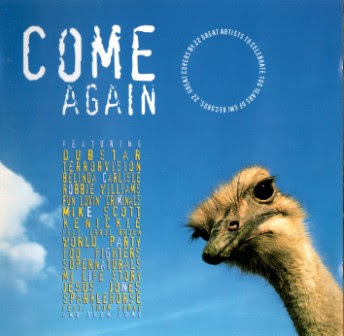 Investigating my iTunes library this morning, I can find only one tune by the band, that being its contribution to the 1997/1998 compilation, Come Again, which was a collection of old rock songs covered by modern acts. (Apparently, that compilation, now out of print, was released in the U.S. under the name, Essential Interpretations.). I have that album, of course, because of its inclusion of a cover of Pink Floyd's "Wish You Were Here," for which the band collaborated with Radiohead frontman Thom Yorke. According to Radiohead fan site Green Plastic, "Thom sang his part on the telephone from his hotel room where you can hear his TV in the background." The cover would later appear on the soundtrack to the 2005 film, Lords of Dogtown. The band had apparently toured with Radiohead in Europe following the release of its 1995 debut album, Vivadixiesubmarinetransmissionplot. Resquiat in Pacem. You missed your true calling of being a hard-nosed reporter.